WEST ORANGE, N.J., – For Travis Hastings and Tori Lubitz, an initial apartment search in Jersey City for their first place together yielded disappointing results. The couple decided to expand the search to West Orange and never looked back after touring The Residences at Edison Lofts in Edison Village. Hastings and Lubitz are now happily settled into a one-bedroom apartment at Prism Capital Partners’ newly completed redevelopment of the historic Thomas Edison Invention Factory and Commerce Center. “We were blown away when we saw Edison Lofts; the place is gorgeous,” said Hastings, 27, who had been living in Jersey City. Lubitz, 26, who was splitting time between Jersey City and Little Silver, agreed. “We never imagined we would get an apartment with this kind of space and ceiling heights combined with the amenities at this price,” she added. 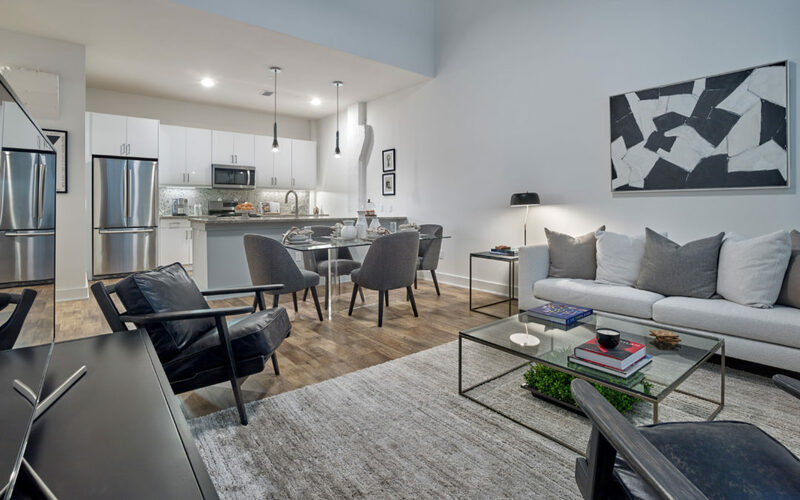 Homes at Edison Lofts take advantage of existing architectural features of the historic factory, incorporating 14- to 16-foot ceiling heights and 10-foot replica replacement windows to let in abundant natural light. All residences feature designer kitchens with stainless steel appliances and luxury bathrooms. The couple’s apartment is situated in the completely reimagined 100-year-old building, which houses 300 studio, one-, two- and three-bedroom units, including 20 penthouse duplex homes to be released in early 2019. Prices begin at $1,750 net rent per month, with the incentive of one month free on a 13-month lease. Hastings and Lubitz were immediately drawn to the abundance of amenities at Edison Village, including the 5,000-square-foot private fitness center. “We are loving the on-site gym with brand new equipment and a stretching room, too,” said Lubitz. The pair looks forward to enjoying time with friends, family and neighbors at the indoor/outdoor rooftop Sky Lounge, which offers 360-degree unobstructed views of the surrounding area and the Manhattan skyline. For Hastings, Lubitz and fellow residents, Edison Lofts also features an indoor swimming pool, sauna, personal and bike storage, media/screening room, business center, private dining room, a dog-washing station, concierge service and covered parking. Shuttle service will be available to and from the local train station for commuting to Manhattan. Edison Village sits on 21 acres along Main Street in West Orange, in the heart of the township’s Downtown Redevelopment Area. Phase I has involved the total reconstruction of the historic factory complex as well as the development of 18,400 square feet of retail, a 630-space parking structure, and The Mews at Edison Lofts, a boutique collection of 34 one- and two-bedroom homes with limited availability remaining. The Edison Lofts leasing center is located at 33 Ashland Avenue and is open seven days per week. For more information, contact the leasing center at 973-327-9748 or Leasing@EdisonLofts.com. For property information visit EdisonLofts.com.